Long before I first stepped foot in the beautiful US wilderness, before I marveled at the canyons, stood under towering saguaro cactus and felt dwarfed by our mountain ranges, there were people here that treated the earth gently, who lived in harmony with nature. Honoring Native American Heritage as a white European immigrant has special significance to me, as I take the time to remember the Native man who became my grandfather. 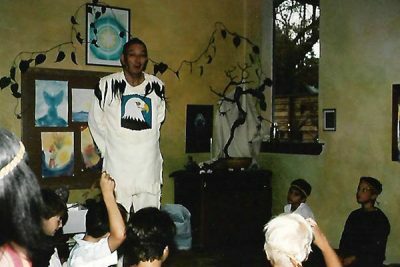 As a child, welcomed by Chief Eagle Rock who lived next door, I spent countless days learning leather and bead work while listening to colorful tales of times gone by. He was a descendant of the Cherokee Nation, his heritage was a mixture of European and Native, and he was eager to pass on his Native ancestral knowledge. And so, even though I carry no genetic material from his Native American ethnicity, I came to understand that our histories, and particularly our futures, are intertwined. Bringing focus to Native American culture during the month of November offers us all the opportunity to connect with and learn about the many Tribes of our nation. Native Americans have been part of these landscapes and cultures for many centuries and their contributions, historic and modern, are a very import part of this nation. Although immigrant relations with Native Americans have a dark past, it’s with great hope that I look towards a future that respects and values Native American traditions and culture. Because we travel with a small group, we can tread with care at Native American historical sites. Living in harmony with nature is an important value, and we explore incredible landscapes of the South West while learning about the various cultures that reside there. On our tours we respectfully visit many unique Native American sites, and include the biggest Powwow, the Gathering of Nations, on our Native Trails tour adventure. 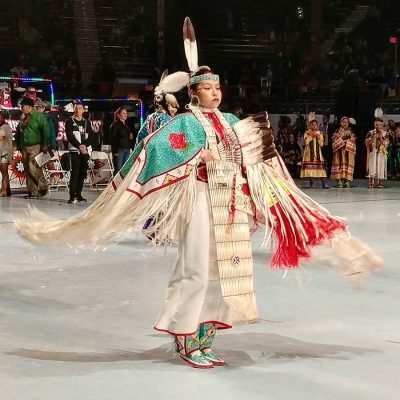 I believe that the best way to understand a culture is to be immersed in the art, music and oral tradition, and partaking in this once-a-year powwow gives outsiders a chance to feel the vibrancy and spirit that the collective tribes share with each other. People come from all over the USA and Canada to celebrate here in Albuquerque, New Mexico. 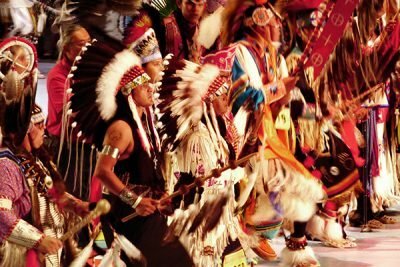 Smaller powwows throughout many Native American communities happen during the year, and these are an important way for Native traditions and cultures to be preserved and shared. 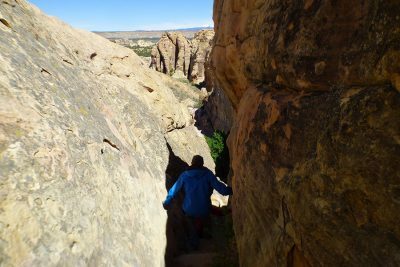 Visiting the Acoma Sky City in New Mexico, visited on our Southwest Adventures and our Native Trails tour, is just one of many unique experiences that bring a greater understanding to the lifestyles and history of the Native American tribes. We appreciate that visitation to this region is under the control of the Acoma Tribal Council, which helps insure that our tourism is beneficial and respectful. 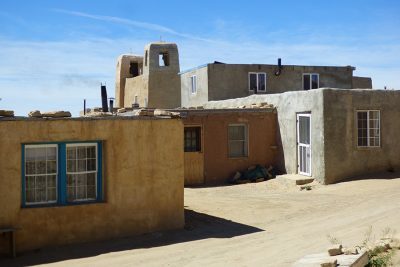 We visit This sacred space with a Native tour guide, who not only shows us the unique pueblo architecture but shares stories about the land and its people. Built atop a huge (over 350 ft.) sandstone bluff the city is made of many beautiful buildings, and the area is believed to have been inhabited by the Acoma peoples since the 12th century. Today there are about 50 people living in the sky city, which as in centuries past has no electricity. 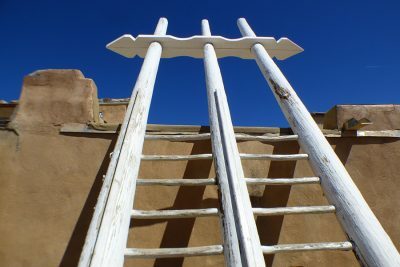 Both the mission and pueblo have been designated as Registered National Historic Landmarks. By exploring with Native American guides and visiting lands governed by local tribes, wandering through towns and browsing through traditional art we are able to support the preservation of Native culture while learning more about it.